The SKB 61 has a re-designed interior to fit all Gibson and Epiphone SG's, except 12 strings, and the ESP LTD Viper series guitars. 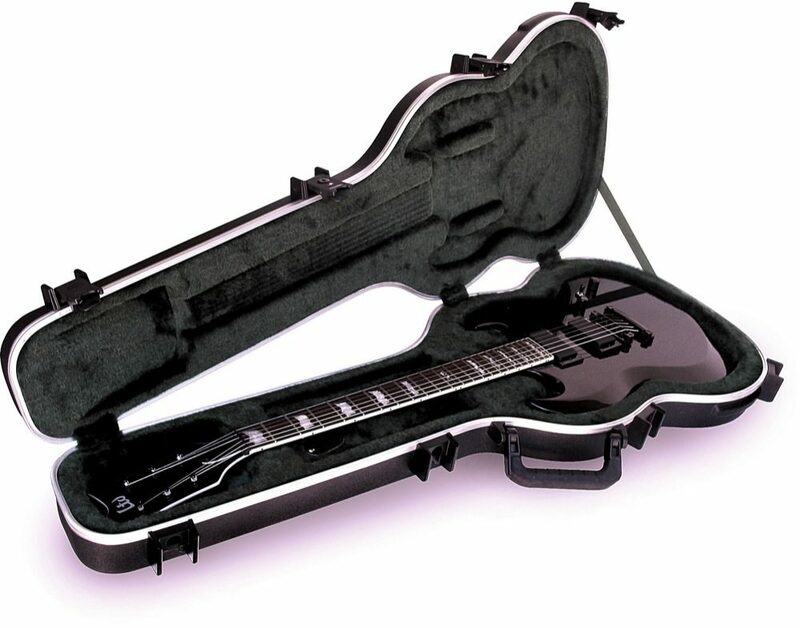 The exterior of the SKB 61 SG Style Guitar case incorporates superior structural and design features such as molecular weight polyethylene shell and rigid EPS interior foam to cradle the guitar securely and absorb shock, molded in bumper design to provide maximum protection for the valance system, and full-length neck support. SKB's trigger release latches are made of indestructible fiberglass reinforced nylon and include a TSA recognized and accepted lock. The over-molded handle is comfortable and perfectly balanced. TSA recognized and accepted trigger release latching system enables you to lock your case and still be inspected at airport security. "TOP QUALITY PROTECTION FOR YOUR SG!" Sound: Not applicable Feature: This is an extremely well constructed case, top quality materials, and sturdy. Ease of Use: I have three different SG models and all fit perfectly in this case, no movement, no sliding, just snug and immobile. I primarily bought the case for a modifed SG Melody Maker as it doesn't seem to fit correctly in a standard Gibson SG case. Quality: The case is well made, durable, and has stood up well to general use (gigging, travel, etc.) thus far. The smooth plastic finish will get a few dings, dents, and scratches, but hey, that's why you buy a case to protect your axe from the same. Value: This case is a little more expensive, but is totally worth the extra dinero. I also had a coupon for 20% off which dropped the case down to about the same price as a standard case. Keep your Gibson case at home, and let this one take any punishment. Also doesn't advertise your Gibson product to potential thieves! Manufacturer Support: Have not needed support for this product The Wow Factor: It's a plain-Jane black case, but I gave it a high rating because of the quality. Overall: Again, plain-Jane, but top quality. This review has been selected by our experts as particularly helpful. "Awesome case"
Sound: Very, very quiet. Feature: Latches stay latched no matter what, the thing is tough beyond belief...It's had all sorts of crap piled (in excess on 100 lbs of ear.) on it, and it (with the exception of a couple scratches) is just fine. Ease of Use: Hinges don't stick, latches don't get stuck...Lid lines up with the bottom half just fine, so it closes securely and easily. Quality: Best case ever. Sturdy, rugged, tough, rock-solid, durable, and all those other adjectives I'm too lazy to think of. Value: It's a little bit pricy for a case, but you get what you pay for... Manufacturer Support: N/A (Thank God...) The Wow Factor: It has a certain understated, monochromatic beauty to it. Overall: I'll keep it as long as I can...I doubt I'll ever have any issues with it - I haven't yet.